Just as there are many approaches to workplace training and delivery, adults respond to training in different ways for different reasons. People vary generationally in the way they absorb and process information, and they also vary in naturally predisposed learning styles. Efficiency demands that training satisfy each of these more or less equally, but actually designing it to this effect can be a nightmare mess of conflicting elements that inclines many to ignore these distinctions altogether. Learning proficiencies can be divided and described in any number of ways; Presented below are two of the most useful and widely-implemented models of learning styles, followed by advice on how to address them both directly and indirectly. The process need not be as complicated as it first appears, as long as the differences and basic characteristics of these styles are understood and kept at the back of the mind. Converging (doing and thinking): Uses learning to find solutions to practical problems and make decisions. Learners of the converging type prefer technical or specialist tasks, and excel at finding practical uses for ideas. They like to experiment with new ideas, run simulations, and work with concrete applications. Accommodating (doing and feeling): Utilizes a hands-on approach, but relies on intuition rather than logic. Learners of this type apply others’ analyses in practical, experiential ways. They enjoy new and challenging experiences, tending to solve problems by carrying out plans. Accommodators often rely on others for concrete information and analysis, but their own intuition, when directed properly, can be used to powerful effect. Assimilating (watching and thinking): Prefers a concise and logical approach based on ideas and abstract concepts. Learners of the assimilating type require clear explanations rather than practical opportunities, and are less concerned with other people. They are great at understanding varied information and organizing it in a logical format, and they appreciate logic-based theories. These people learn best with readings, lectures, analytical models, and time to think things through. 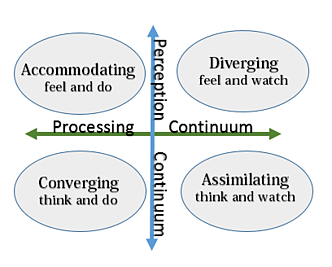 Diverging (watching and feeling): Is able to look at concrete situations from several different perspectives, and is sensitive to the needs and considerations of people and interpersonal elements. Learners of this type prefer to watch rather than do, gathering information and using their imagination to solve problems. They perform well in scenarios such as brainstorming which require the generation of ideas, and work best in groups that involve a lot of feedback and communication. 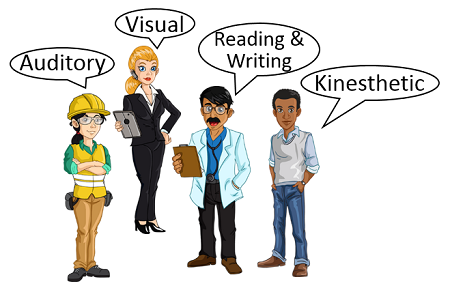 Visual learners learn best when information is presented in the form of various labeled maps, charts, diagrams, hierarchies, and symbols, representing visually what could be described in words. Auditory learners prefer information that is heard or spoken by themselves or others; this includes lectures, group discussions, digital presentations, and talking things through. Reading/writing learners like to gather their information through good old-fashioned words and text-based input. They do well with reading and writing in all its forms, but especially manuals, reports, essays, and written assignments. Kinesthetic learners glean information from direct experience and applied practice. This might involve demonstrations, simulations, case studies, and videos containing “real” examples. Kinesthetic or tactile learners value concrete understanding and do not benefit as much from the experiences of others. Provide employees with a variety of options. The whole crux of this issue is striking a balance between choice and unified structure, and technology makes this balance easier than ever to achieve; it can offer learning in an immense variety of different formats while ensuring that everyone receives the same quality and depth of education—all within a prebuilt, integrated system. If you can get such a system working right, you can avoid much of the hassle while still providing employees with a breadth of useful and highly personal training that they won’t hate. While technology handles the logistics of a lot of the harder work, you can feel free to train all employees in whatever way you see fit, as long as there is some variation in the format. Acknowledge the different learning styles. As long as the resources are available and employees feel comfortable using them, needy learners can seek out much of the information they lack. Provide incentives to encourage this, or, if you feel that it’s necessary, hire a learning specialist to help train people individually according to their needs. There are many free tests available to determine people’s learning types and cater to them directly. As long as you make sure that all learners have access to the resources they are best suited to, not only in training but in daily work, the learning will follow, and it will be ongoing. Don’t overdo it. Keep learning styles in mind and ensure that they are properly accounted for, but also keep in mind that these models are not absolute. The labels blend together not just with each other, but with other factors and educational principles as well; the wisdom of “relating training to real life” still applies to everyone, but perhaps in slightly different ways. You need not restructure everything to accommodate for learning style differences, as long as options are available that work for all kinds of employees. Do exactly as much as it takes to foster an environment where learning proficiencies and individual talents are best taken advantage of. Our goal is to help you identify the most effective types of training and weigh their benefits so you can figure out the best fit for your team members. Check out our chart, which compares Classroom vs. Virtual Training across 15 different measures.